It's hard to believe it's June already and summer is in full swing. Summer certainly isn't the season we think of when we see cranberries. 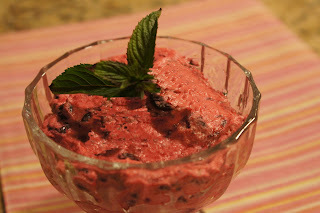 However, for this months Secret Recipe Club I am sharing a recipe with you that features the beautiful berries. My assigned blogger is Claudia of From Arepas to Zwetschgen. Claudia, like me has lots of cookbooks and began her blog to journal her recipes. Funny she says her husband mentions, it's hard to like a dish featured on her blog because you never know when you might have it again. My husband says the same thing. Claudia says they don't really eat a lot of desserts but this is a favorite because it reminds her husband of Himbeertraum, Raspberry Dream. My husband said this reminded him of a dish his mom made for Thanksgiving! I didn't add the chopped merinque. We felt it was a little more tart than we would have liked. I would suggest adding the merinque, a little more sugar or even some honey to the cranberry mixture. Bring sugar with 150 ml water to a boil. Add orange zest and simmer for 5 minutes. Add cranberries and orange juice, simmer for 5 minutes until all cranberries are burst open. Remove from heat, let cool. (Pass through a sieve if you desire a smoother texture and less bitterness.) Whip cream. Lightly fold cranberries, meringue (if using) and liquor (if using) into cream. Or layer ingredients in a bowl and lightly mix just before serving. I am linking this to On the Menu Monday, Tasty Tuesday, Miz Helen's Full Plate Thursday, Foodie Friday and Sweet Tooth Friday. I haven't had cranberry fool in decades, thanks for bringing the recipe back to me. Yummy! this looks unique and refreshing! Thank you for letting me rummage through your recipes for my SRC post! Good SRC choice. We love the "fool"-type desserts - no matter wich fruit. I am a cranberry fan all year long...not just during the holidays. Great job! We don't get fresh or frozen cranberries, else I would've like to try this out. Maybe I'll have to use some other fruit instead! Sounds like a great dessert recipe to save for Thanksgiving when I 'm always scouting around for something made with cranberries. Looks like a great combination of sweet and tart. Yum. Your Cranberry Fool looks delicious! Hope you are having a great week and thank you so much for sharing with Full Plate Thursday. Cranberries may not be a typical summer food, but a fool is perfect any time of year. This looks so pretty! Looks delicious! So funny abbut blogging and not seeing the recipe again.